NZ biking – a final two-day solo ride along Forgotten World Highway, through spectacular rainforest, and… sheep. Oodles of. I’m going that way. In the heart of Forgotten World Highway country. OK, my name is Mark and I’m an internet addict. And this is positively (probably) my last post (sounds of trumpet) from solo biking in NZ, with a map to show you where I started and where, on this last Saturday in 2012, I’ve ended up. Which is, slap bang in the middle of the North Island ready for car collection by Kat and Mela and transport on East to Napier and the vineyards of the East Coast. Read on beyond the map below for some concluding thoughts and some pix of an amazing two days and 160km/100 miles from Stratford (near New Plymouth and, yes, complete with a mock Tudor clock tower that plays, supposedly, lays from Romeo and Juliet) to Taumarunui. And as ever, a fuller set of pictures on Google+ here. Starting this collection of pictures with proof from my cycle computer that I really did cross the 1000-mile mark, just in time before the end of my solo biking in NZ. Which started in Queenstown three weeks ago today ( Saturday Dec 29th) via the South Island West Coast, and up via three days Christmas rest in New Plymouth with daughter Kat and partner Mela to where I am now. Note, if you’ve browsed this far down, that today, as an uxpirimunt – sorry, experiment – I’m posting pictures widescreen, with individual captions, rather than long, boring, coherent tixt. Sorry, text. Sis-in-law Claire says I appear to be afflicted by blogging diarrhoea, so to be avoided, I think. Let me know, if you like, what you think of this way of posting pix and words. Deep in rain forest territory, along the Forgotten World Highway. One of the most amazingly beautiful roads I have ever ridden, and a reminder what New Zealand looked like before humans arrived, first the Maori by canoe from Polynesia to wipe out much of the flightless bird population and start torching the forests, then the Europeans who finished the job with ruthless efficiency in the late 19th and well into the 20th centuries. Of course, it’s what humans have done in Europe over the last 2000 years, it’s what Europeans did in North America in 1700s and 1800s, it’s what’s now happening in Indonesia with palm plantations and in Amazonia with beef farming. It’s what human beings do and have been doing since the invention of agriculture. And with 7 billion people on the planet, it’s totally unsustainable. And this is what the rainforest was turned into. Bare, grassy hillside fit for sheep and cattle, and little else. Sheep, it struck me cycling here these past two days, are like lice on the landscape. NZ now has 35 million of them, half what it used to have. And dairy cattle are booming in their place. All to feed the powdered milk needs of China, and the pet food industry in America. 100 years ago, European settlers torched and stripped hillsides across New Zealand on the understanding that one blade of grass, which livestock could eat, was worth two Kauri trees, which may have been growing for up to 2000 years, but which did not sustain humans. 97% of NZ’s Kauris were destroyed within a few decades. It makes me want to weep. Before – left – and after – right. Seagulls on the pondside. By this point yesterday, I really didn’t think I could survive the view of yet another hillside covered in sheep and cattle. Moaning over. This has to have been the most amazing campsite I have ever stayed at. A flat spot at the Back Country site at the level of the surrounding peaks, just East of Whangamomona. Whence also the following view in the morning. A view across distant misty peaks, which until 200 years ago were the densest rainforest. 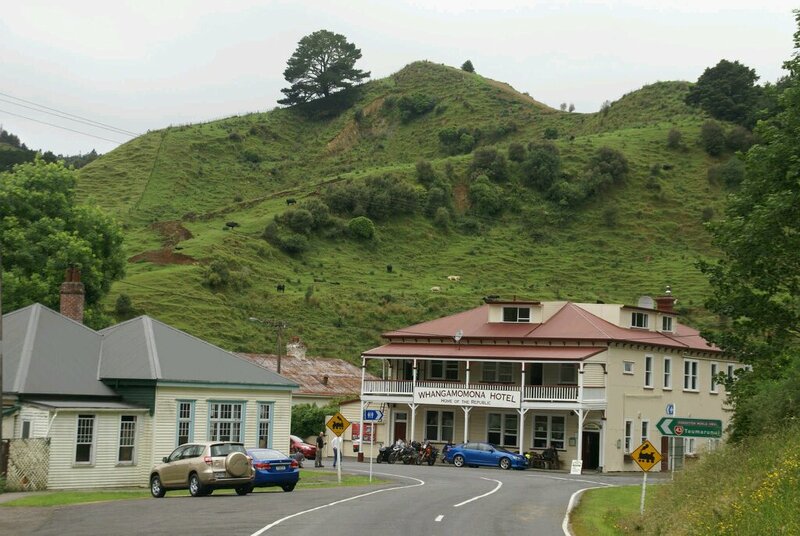 The magnificent Whangamomona Hotel, also now up for sale…. I could go on posting pictures for ages here, but if you’d like to see the rest for the past two days, click this link. Alternatively, stay on for an amusing final picture, spied on the way into Tauramunui. Mania Road, GIVE WAY. And could be bends ahead. A case, methinks, for some psychlotherapy. Hope you’ve enjoyed these pics and these musings. Sorry (not) for the going-on about climate change and sustainability. Biking 1000 miles through NZ in its amazing beauty has just brought home to me, even more sharply than before, how human beings have trashed, and continue to trash, our gorgeous planet like young children with a shiny new toy. Play with it until it’s broken, then throw it away and whine that you need a new one. We don’t have a new planet to buy, and as just a few hundred years of human habitation in NZ show (and the Maoris weren’t much better in principle than the Europeans, they just didn’t have the technology) we’re damn close – actually, as you know, I think we’ve already blown it – to terminally breaking the one we have. Conclusion? Half my family think I’m mad, and many of my friends too. But, cycle now while stocks last. LOVE the picture of all the sheep on the hills! Loving the lice on the landscape and the fact that the grass looks like a pile of unfolded clothes! Bumpy and tricky would be my response to this terrain but Mark he thrives on such things! PreviousDaughter Kat and Mount Taranaki both reached. 900 miles in 16 days. One chuffed psychlotherapist.